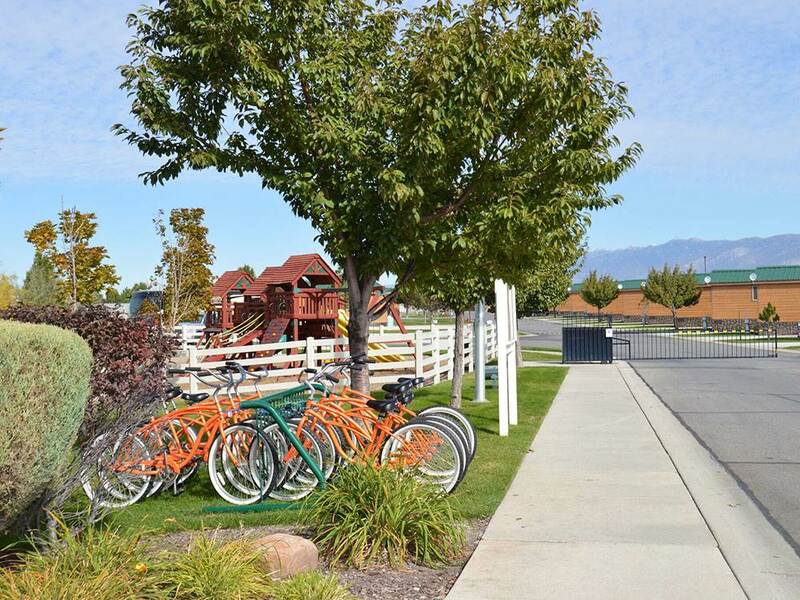 Minutes away from the Great Salt Lake and downtown Salt Lake City. Travel around the area with one of our Surrey bike rentals, or stay onsite and enjoy our pool, life-size board games, general store and more. Beautiful facility located in an industrial area. Close to Salt Lake City attractions. Very helpful staff. Facility is very well maintained and new. Restrooms and showers are clean and modern. Laundry facility is very nice and has an attached recreation room that is beautiful. Nicest RV facility that we have experienced. Would definitely stay here again. Beautiful park. Nicely landscaped level sites. Easy in and out of park. Secure facility and super clean. Bathrooms were spotless and private. Alot of amenities. Staff was very warm and friendly. We travel to Utah at least one a year and would defifnately stay here again. Very friendly and welcoming staff, clean facilities and park, and DOG FRIENDLY with all breeds! The sites are a bit close together but offer nice green grass, shade trees and level concrete parking pads. The noise from the nearby freeway wasn't objectionable. Great access to I15 north and south and a Flyin J truck stop is nearby. Will return for sure! We stayed 1 - 6 May 2018 in a 36' motorhome towing a jeep. Sites were all concrete and level. Hookups were easy to get to and not in the way. Sites were spacious and we had no problem putting out our slides or awning. Staff was very friendly and helpful. There was plenty of room to park our car and for visitors to park right at our site. They have a small soccer field, horseshoes, basketball, pool, and a large chess board to keep both you and your children occupied. Park is close to the belt loop around Salt Lake City but traffic noise is minimal. The park is gated which adds to the feeling of safety. Two staff members live on site so there is someone available 24/7 if you have a problem. Also, the park is located behind an RV dealer so if you need work done on your unit, they are right there. I'm not sure what the person who complained about sites being too close together was thinking unless he confused this facility with a different one he had stayed at. This facility is what all RV parks should strive to be like. This is our "go-to" facility whenever we travel to Salt Lake City. Perhaps the best park on our 6 week trip. Gated park with concrete pads and full hook ups. Excellent showers and rest rooms. Close to LDS Family Library if you do family research. Clean and well maintained. We were close the Expressway exit so there was some traffic noise at night. WIFI was the best of trip. Staff is awesome. Tight lots and parking, but acceptable for a large clean park. Will stay here again on next trip to Salt Lake City. A very nice and clean RV park. The park was gated which added an element of safety. It is just off the freeway, so there was some noise, but not enough to be irritating. The grounds were well kept, and it had long and level pull-thru sites. The shower facilities were a little old, but were clean. It was a great place to stop along the way up to Idaho. This is a beautiful clean gated park just north of the city with easy access but shame on them for being so greedy to put sites so extremely close together. We could barely open our truck doors and when I stepped out I had to be careful not to step on a sewer connection for the site next to us. We will try not to stay here again for that reason alone. Stayed 2 nights in a 45 ft. motorcoach. Long site with parking for toad. Clean bathrooms/showers. Maybe it was just bad luck but my stay was not great. Power at pedestal was low on 1 leg (106vac) and we had to move to another site. Internet was down for the 2 days we were there. Because we moved to another site, they deleted our gate code so we needed to tailgate until they fixed it . We were traveling through and just stayed one night. The sites are cemented and level. Plenty of grass areas that are well maintained. We travel with shetland sheepdog and there are plenty of nice areas to walk here. There is an RV dealer next door making it easy to stock up on any parts that you need. The location is not near any attractions although we were able to drive the RV about 20 miles north to see antelope island. We also drove downtown to see Temple Square but really no where to park the 30 foot RV. Overall very nice place to stay with friendly people. First of all let me say that this is a beautiful RV Park. The sites are concrete with a grass area and a parking pad. The park is well kept - beautiful pool and playground. Lots of grassy areas to walk dogs and they have poop stations throughout the park. The problem lies with their electrical. We were assigned one site where our power kept tripping. They sent out an electrician who revealed that the whole park is wired with aluminum wire (not good). We have a 42 ft 5th wheel - 3 a/c units - a convection microwave and induction cooktop. Our surge protector said we were only getting 104 amps on one leg, and about 114 amps on the other. We couldn't even run one a/c and the microwave at the same time much less 2 a/cs. The park moved us to another spot where we could at least run 2 a/c's - but we would have to cut one off to cook anything. Totally ridiculous!!! They did compensate us for one night's rent, but they really need to put some money into updating their wiring. We stayed 2 nights, on our way from west coast to midwest. There were some sites that appeared to have been occupied for several months,did not look junky, just had extra insulation around unit or larger LP tanks.Campground looked new. Our site was easy to access, & level. Sites are not very wide. Grass looked nice. The restrooms were comfortable, individual heaters in each one. We were not able to access the wifi during our stay. Since we were not going to be there long, we just used our hot spot. If we had been there longer we would have worked to find out what the problem was and how we could access the wifi. We had to ask for our Good Sam discount, check in person did not offer it. Bought propane at Pony Express, OK value, not too high a price, or exceptionally low either. We were close to downtown.